Appartement 3 ch. 2 sdb, grande terrasse de 35 m2, garage dans l'immeuble. Living avec poêle à bois. Salle à manger et cuisine américaine. Construction récente,décoration soignée,tout confort et toutes comodités (lit,chaise et jeux enfants, vélo de chambre, équipements électroménager et vaisselle comme pour les propriétaires),à proximité du village blanc andalou , possibilité de connexion internet haut debit. En dehors de la grande affluence de Nerja, superbe terrasse avec vue sur mer (à 6 km) et sur la montagne. Un des plus beaux village blanc d'Andalousie. Très bien équipé (vaisselle et équipements comme pour nous-même) + tout l'équipement pour enfant (lit d'enfant 0-4 ans) , chaise haute, jeux ..Wifi (avec supplément ). Friglliana is a very beautiful place. The apartment was lovely very well equipped. A few minor problems with keys but it was sorted very quickly. I would certainly stay again, The large terrace is great outdoor space. Close to restaurants and Bars. Wonderful property in a perfect location with a wonderful view! Our second visit to this apartment in less than a year and again it was fantastic. The apartment has everything you could possibly need, spacious inside and out. A perfect location just a few minutes walk into the centre and cobbled streets of the old village. Faultless again! Thank you. Fabulous location, spaccious with fantastic views from the balcony. Extremely well equipped!! This apartment was set 76 steps from the quaint cobbled streets of the old village. The location was perfect as the village could also be reached along the main road overlooking the valley which was ideal for my elderly mother. The apartment itself was extremely well equipped and short of nothing! The balcony was very spacious with views overlooking the hills and down to the sea. The housekeepers were lovely, friendly and very helpful. Frigiliana itself was absolutely beautiful! An ideal, low key holiday retreat with plenty of choice for food and drink. Perfect for those wanting to get away from the hustle and bustle of working life. We found nearby Nerja to be too touristy and not as relaxing as the village. Nearby the apartment you will find a bar serving food and drink and a selection of supermarkets within a few minutes walk. 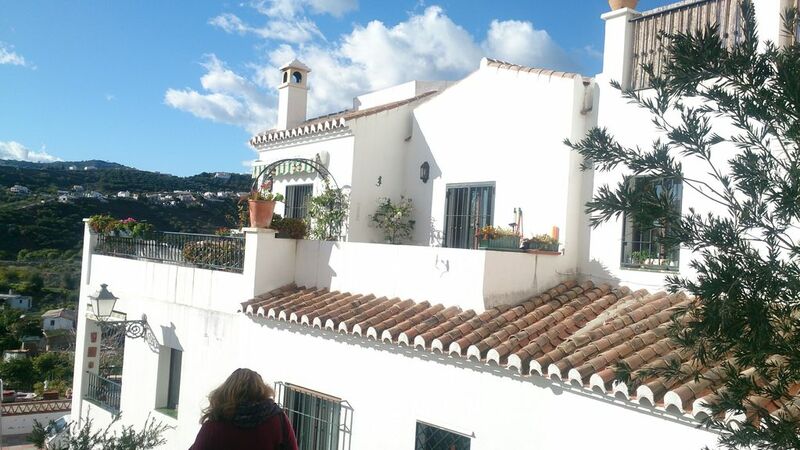 We are frequent visitors to Frigiliana but this was our first time to this apartment. It's really well positioned on the main drag but just be aware that early nights are a no no because you're right in the thick of things. The apartment is very well equipped and we thoroughly enjoyed using the kitchen - we even had a go at the local aubergines & honey dish. It's starting to be a little tired but this is a really nice, comfy apartment with decent space inside and out and I would highly recommend it.